Canton DM 900 review | What Hi-Fi? 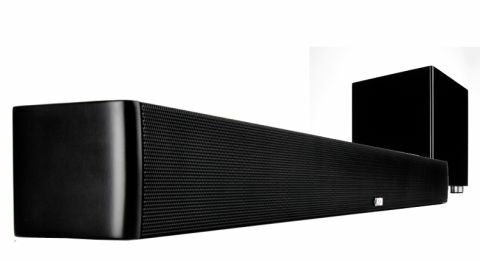 At this price, soundbars tend to look pretty menacing – many of them are chunky beasts. But not the Canton DM 900. What you get is a short, slim bar that won’t block the bottom of your TV, with a separate subwoofer to provide muscle. Inside the bar itself you get two 19mm tweeters and four 50cm drivers. The bar can be wall-mounted, or placed straight on a rack. The sub, meanwhile, has a 23cm downward-firing woofer. These are well-made boxes. The bar has enough metal to belie its delicate appearance. The sub is guaranteed to win any argument against your little toe. At the back of the bar, you’ll find analogue RCA, coaxial and optical connections, and cables for all three are included, which is nice. You can go Bluetooth too: aptX compatibility means you can benefit from higher-quality streaming with compatible devices. There’s also a ‘sub out’ socket for the subwoofer, but you don’t have to use it; the sub can also connect wirelessly, with a maximum distance of 10m. We’re pleased to see a proper remote control included. It’s a weighty device that fits nicely into your palm, and the buttons are smooth. It’s not entirely intuitive, however. The EQ, dynamic range control and lip sync settings are hidden, and you must hold down a specific button to unlock them. Even then, you’d need the instructions to help decipher them. The tiny display on the soundbar doesn’t tell you that ‘EQ-3’, for instance, is for set-ups on racks. Still, once you’re all set up, things go smoothly. Well, almost. Canton recommends 15-20 hours of listening to break in the system. We oblige – but even after a weekend of continuous play, we aren’t entirely satisfied with the performance. The sound is thin, and a bit disjointed. The integration between the bar and sub isn’t wholly convincing. Bumping up the bass or messing with the EQ doesn’t do much, besides thinly masking the lack of balance. We put on Captain America: The Winter Soldier to watch Robert Redford arguing with fellow government officials, and the result isn’t particularly convincing. Subtlety is lacking, as are dynamics. The sense of indignation in the voices is sanded down significantly. It’s not all bad, though. The treble is well balanced, never sounding hard or making us wince at the top end. There’s a good sense of space, but similarly priced rivals easily outclass this. Pressing the virtual surround button helps to widen the sound a little, but it will cost you clarity of voice, and push down the level of subtlety just a little further. We like the idea of the Canton DM 900. The space-saving design of the bar is to be appreciated, and there are clearly benefits to being able to position the subwoofer as you see fit. But in practice, and at this price, this set-up is inadequate against the competition. We’ve heard a few excellent TV accessories from Canton, but this is not one of them.